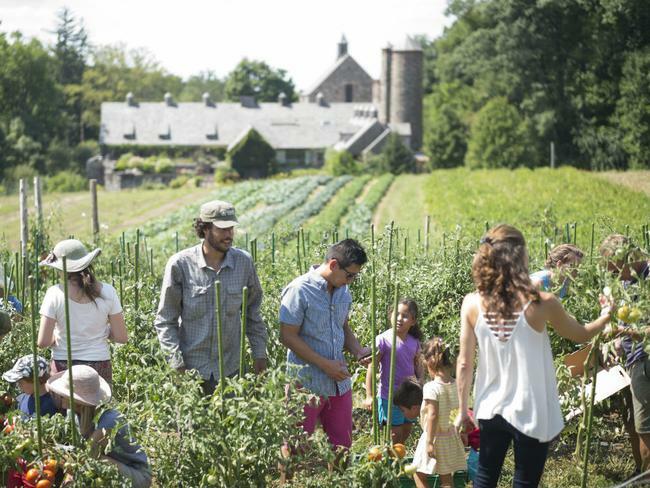 Less than an hour's drive from Manhattan, the nonprofit Stone Barns Center for Food & Agriculture lets New Yorkers experience a working farm, exploring its 80 acres of fields, pastures and woodlands in Pocantico Hills, near Tarrytown. The center was founded in 2004 by David Rockefeller and his daughter Peggy Dulany in honor of Peggy Rockefeller, a lifelong conservationist, and continues to expand its vital agricultural and scientific work, making advances in sustainability, education and support for independent farms. Open Wednesday to Sunday, Stone Barns hosts family-friendly activities on the weekends from April through November, such as greenhouse tours, foraging walks, egg collecting, "meeting the sheep" and watching the pigs get fed (just know that the program varies from week to week). Visitors are also free to roam the grounds on their own. In July, the farm is also presenting three open-to-the-public lectures on Thursdays at 7pm, featuring women whose work focuses on food, agriculture and climate change. As a beneficiary of May's charitable auction of David and Peggy Rockefeller's art collection at Christie's, Stone Barns has exciting plans afoot for 2018. It's launched the Food Ed program for high school students, which it's taking national by training more than 100 teachers from around the country in the curriculum this summer. The center is also working with the Rockefeller State Park Preserve to steward 300 more acres donated by the Rockefellers, and will be grazing livestock and raising hens and ducks on the land, while improving the wildlife habitat. In addition to its partnership with the famed Blue Hill at Stone Barns restaurant, helmed by chef/co-owner Dan Barber, the farm appeals to foodies with its casual on-site cafe, a CSA for weekly produce pick-ups for members, and goods like eggs and honey in the gift shop. In addition, the team posts frequent videos focusing on ingredients growing in the fields. You can also taste the season with the site's recipes. This cool beet salsa is a popular one in Stone Barns' high school program—perfect when the temperature spikes, since it doesn't require any cooking. Learn more about reserving tickets and visiting the farm, which is open Wednesday–Sunday 10am–5pm, and can be accessed by car as well as the Metro-North to Tarrytown and a taxi the rest of the way. See the calendar of events and call the visitor center at 914-366-6200 x130 to find out about upcoming weekend activities.